Anti-Trump Protesters March Nationwide [VIDEO] - Joe.My.God. Protesters took to the streets Wednesday in at least 10 cities to march against president-elect Donald Trump – and numerous college students and faculty leaders took to social media to announce support groups and even postponed exams. Protests were underway in Chicago, New York, Los Angeles, Philadelphia, Boston, Washington, D.C., Portland, Ore., St. Paul, Minn. and several other cities. 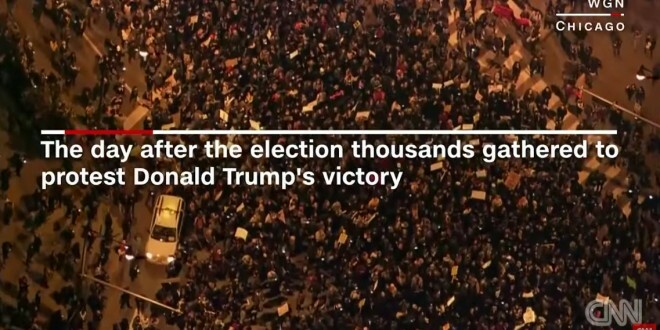 An estimated 2,000 protesters shouted angrily in downtown Seattle, expressing their frustration at the Trump victory over Democrat and former Secretary of State Hillary Rodham Clinton, who won 228 electoral votes to Trump’s 279. Police in riot gear struggled to hold back scores of protesters in some of the cities as protesters chanted “Not My President” and “No Racist USA.” The protests were mostly peaceful. Seattle police said they were investigating a report of a shooting near the site of the protest in that city, but it may not have involved protesters. In Los Angeles, protesters poured into the streets near City Hall and torched a giant Trump effigy, the Los Angeles Times reported. Later in the night, hundreds marched onto the busy 101 Freeway which brought the highway to a complete standstill. The California Highway Patrol and the Los Angeles Police Department —who urged protesters to remain lawful and peaceful — responded and were seen leading demonstrators away from the busy highway. At least 13 people were later arrested, LAPD Officer Tony Im told the Los Angeles Times. Next Did RBG Wear “Dissent Collar” As Trump Slam?